John Anthony Simmons (1802-1868) was a free black man who owned a Nassau Street catering service and eatery frequented by students of the College of New Jersey. Simmons was reportedly born a slave in New York City, but little is known about when he was freed or why he left New York for Princeton, though his obituary noted that he moved to New Jersey in his youth and lived in Princeton for almost fifty years. 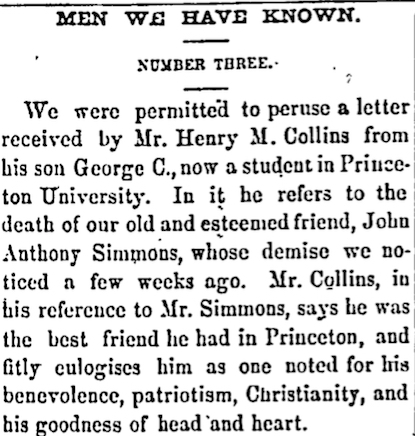 Anthony Simmons's obituary, published in 1868. Simmons managed to remain on good terms with members of the white community while also actively participating in abolitionist activism. 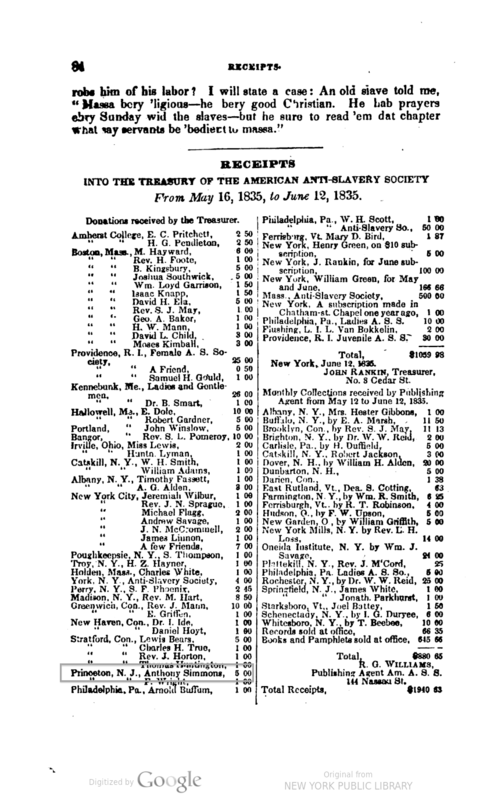 During the spring of 1835, Simmons donated $5.00 to the treasury of the American Anti-Slavery Society, whose constitution called for members to “put an end to the domestic slave, and to abolish slavery” and to “elevate the character and condition of the people of color, by encouraging their intellectual, moral and religious improvement.” On May 15, 1840, the nomination committee elected Simmons as vice president of the society in New York, but he declined. Years later, in 1865, Simmons attended the State Convention of Colored Men that assembled in Trenton, New Jersey as an honorary delegate. Receipt for Anthony Simmons's donation to the American Anti-Slavery Society in 1835. Simmons achieved a measure of social mobility with the profits from his lucrative small business enterprises. Simmons's food shop, catering services, and bathhouse made him wealthy enough to acquire half a dozen properties in Princeton as well as contribute to black community institutions. In the mid 19th century, Simmons' Nassau Street eatery—consisting of an oyster cellar, ice cream parlor, and confectionary—was a favorite of Princeton students. In his diary, John Robert Buhler (class of 1846), described visiting “Anthony’s” for oysters and ale in the winter and spring, ice cream in the summer, and an unidentifiable snack he called “Horace—fine, fat, and greasy." According to another account, Simmons catered the college baseball team’s dinner in Mercer Hall, “served up in Anthony Simmons’ best style” with “plush beverage,” a “delightful mixture” of claret diluted with water. He also catered for local families and other Princeton associations' public dinners and evening parties. 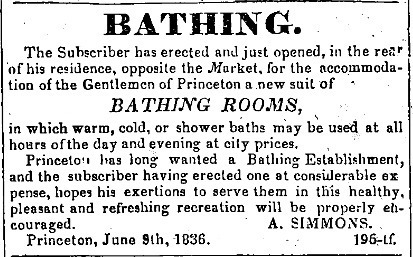 Along with his culinary businesses, Simmons ran a bathhouse near his home, built "at considerable expense," and advertised in the Princeton Whig from June through December 1836. He charged 25 cents for warm baths. Princeton Whig advertisement for Anthony Simmons's bathhouse, published in 1836. 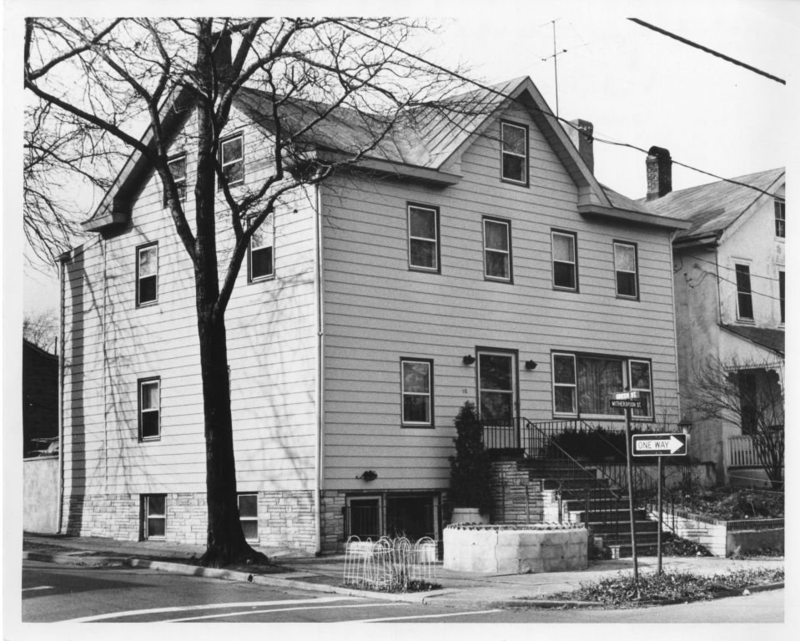 Simmons and his wife Susan lived at 110 Witherspoon Street—the heart of the local African American Witherspoon-Jackson neighborhood—a location that reflected his leadership in Princeton's black community. Simmons was the largest donor to the Witherspoon Street Presbyterian Church and helped to establish a school for black children off of Quarry Street, signing on as trustee for the property where the schoolhouse was ultimately built. By 1860, he owned $10,400 in real estate and $1,600 in personal property, out of which he bequeathed $500 to the College of New Jersey upon his death. Anthony Simmons's 110 Witherspoon Street house, purchased in 1847. Civil rights activist, singer, and athlete Paul Robeson would be born in this house in 1898. 1850 and 1860 Federal Censuses, accessed 14 February 2017, www.ancestry.com. Censuses list Simmons as "Anthony Simmons," but his obituary uses the full name "John Anthony Simmons." 1850 United States Federal Census, Princeton, Princeton, Mercer, New Jersey, accessed 14 February 2017, www.ancestry.com; "Survey and District Evaluation, Witherspoon-Jackson Community," accessed 15 February 2017, www.princetonnj.gov; “Died,” Princeton Standard, 14 February 1868. “Men We Have Known,” The Elevator, 3 April 1868. R.G. Williams, The Anti-slavery Record, v.1 (New York: 1835), 84; “Constitution of the American Anti-Slavery Society,” The Liberator, 11 January 1834. “Annual Report of the American Anti-Slavery Society” (New York: American Anti-Slavery Society, 1834-61), 19; The Liberator, 5 June 1840, 3. William Steward, et al., Proceedings of the State Convention of Colored Men of the State of New Jersey (Trenton, NJ: 1865). “Died,” The Elevator, 20 March 1868. Simeon F. Moss, “The Persistence of Slavery and Involuntary Servitude in a Free State (1685-1866)” in A New Jersey Anthology, 2nd ed., Maxine N. Lurie, ed. (New Brunswick, NJ: Rutgers University Press, 2002), 203. Varnum Lansing Collins, Princeton 1870-1936 (New York: Oxford University Press, 1914), 190-191. Frank Presby and James Hugh Moffatt, Athletics at Princeton—A History (New York: Frank Presbrey Company, 1901), 80-81. Hageman, History of Princeton and its Institutions, 210. “Bathing,” Princeton Whig, 10 June 1836. “Warm Baths,” Princeton Whig, 23 December 1836. Anna Bustil-Smith, Reminiscences of Colored People of Princeton, N.J., 1800-1900, (Philadelphia: P.V. Baugh, 1913), 3; “Men We Have Known,” The Elevator, 3 April 1868; "Survey and District Evaluation, Witherspoon-Jackson Community," accessed 17 July 2017, www.princetonnj.gov. 1860 Federal Census, Princeton, Princeton, Mercer, New Jersey, accessed 14 February 2017, www.ancestry.com; John H. Stewart, Reports of Cases Decided in The Court of Chancery, The Prerogative Court, and, on Appeal, in The Court of Errors and Appeals, of the State of New Jersey, vol. IV., (Trenton, NJ: MacCrellish & Quigley, 1880), 2; “Men We Have Known,” The Elevator, 3 April 1868; “Notice: Estate of Anthony Simmons, Deceased,” Princeton Standard, 4 March 1868.